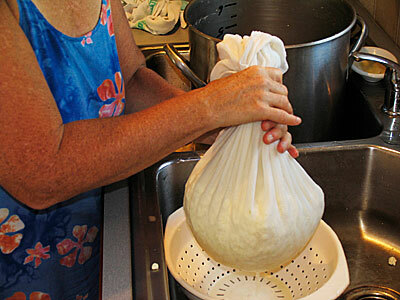 This is about as simple a cheese as you, the home cheese maker, can make in your own kitchen. 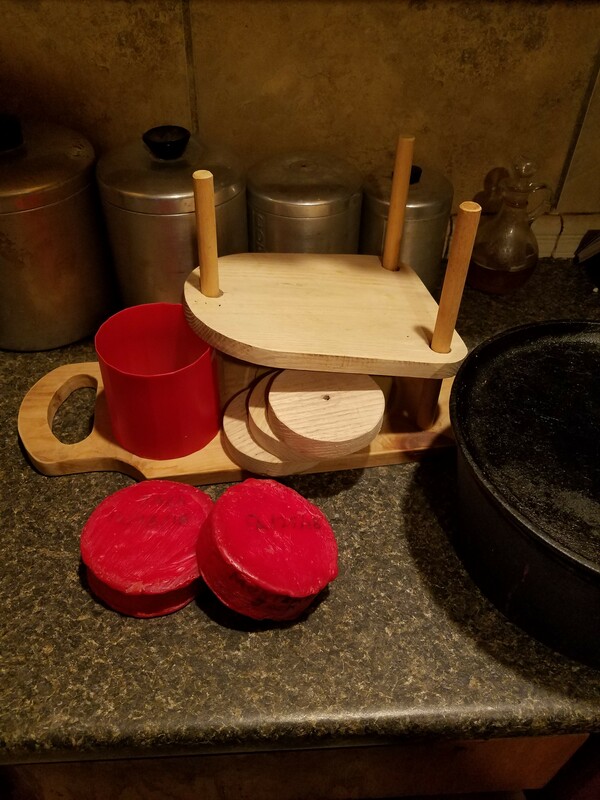 It requires no forms, no press, and about as little effort as a cheese can be. All you need is, some milk, a pot, a piece of porous cloth, a couple of boards and a rock. 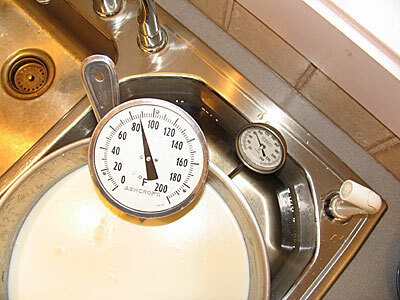 MA 11 Mesophilic starter culture can be used to make a variety of semi-soft and fresh cheese including Cheddar, Colby, Monterrey Jack, Feta and Chevre. 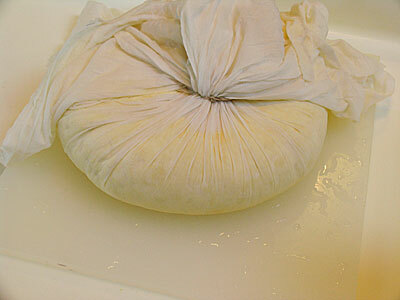 Cheesecloth is used for draining large curd cheese, lining hard cheese molds when pressing cheese and for bandaging finished cheese. This durable cloth is 100% cotton, can be reused and is machine washable. 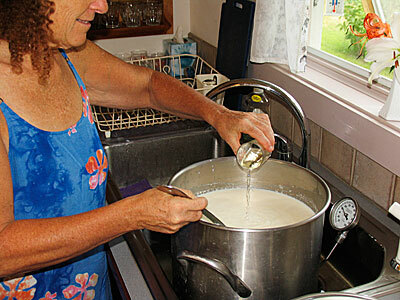 We began with 5 gallons of local milk (whole pasteurized milk from your store will work just fine). We then heated the milk to 88¡F and added 3/8 tsp of culture MA011 but one of the culture packs C101 will work just as well. It was then allowed to ripen for 60 minutes. To heat our milk, we made a water bath in the sink by filling our sink with hot water and submerging the pot with milk. This heating method helps maintain a steady temperature without having to adjust the heat on a stove top. 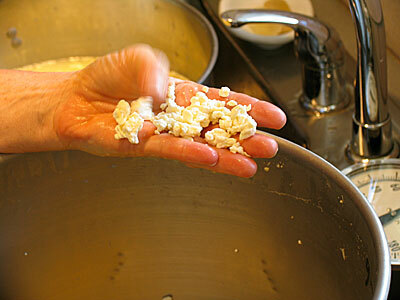 Next we added 2.5 ml or 1/2 tsp of calf rennet which formed a solid curd in about 40 minutes. 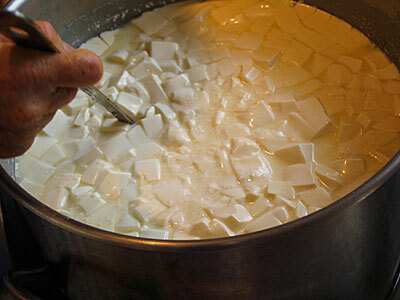 Once the firm curd was established it was cut to 1/2" cubes then let rest for about 5 minutes before stirring for another 20 min. 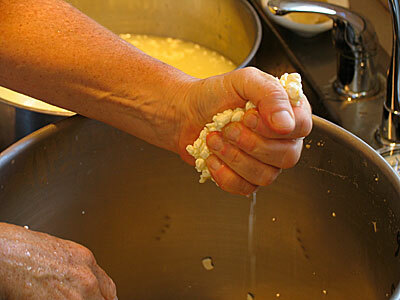 At this point the curds are extremely fragile and must be handled with care. We then began a long slow stirring while we slowly raised the temp to 100F over 40 minutes. 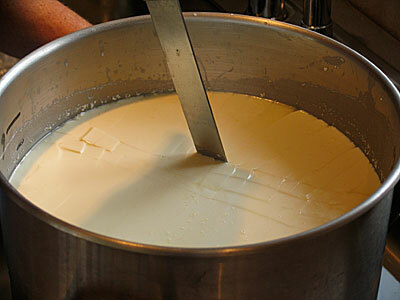 This step dries the curd out by removing the whey from the curd. Following this we stirred slowly for another 30 minutes as we watched the individual curds become smaller and toughen up a bit. Our final step in the kettle was to 'pitch' or let the curds sink to the bottom for 25-30 minutes with gentle stirring every 3 to 5 min. Here they will now not lose as much moisture but will continue to produce lactic acid. Our final step was a simple texture test as shown above. Ricki takes up a small handful of curd and squeezes to compact. If it breaks apart easily with the thumb into individual curds it is ready if it sticks together let it set for another 10 minutes. 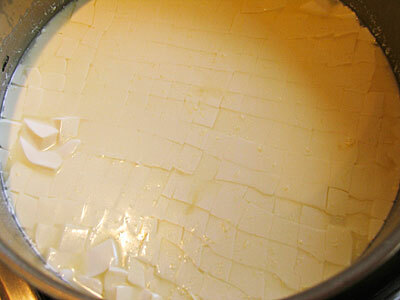 Let the curds settle to the bottom of the pot. Now remove the whey down to the curd level. 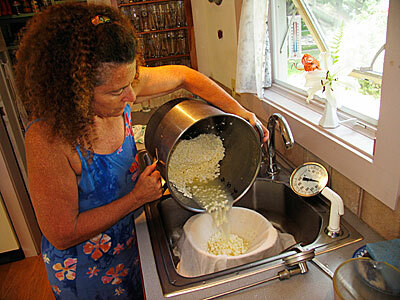 The curds can now be transferred into a colander lined with cheese cloth. 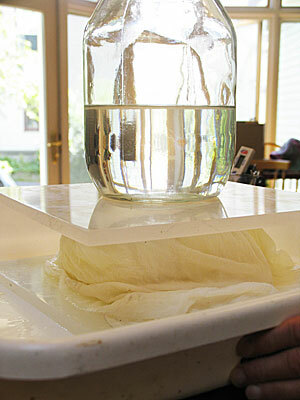 Once transferred, add about 2.5-3 tbs salt and mix in well. 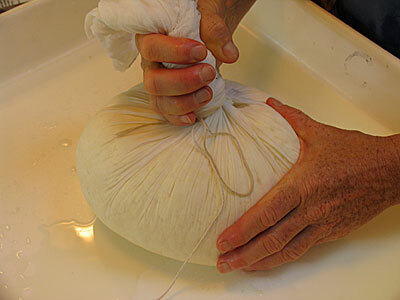 After salting the ends of the cloth are brought together and the entire curd mass is shaped into a nice round ball pulling the cloth up and consolidating it as the whey runs off. 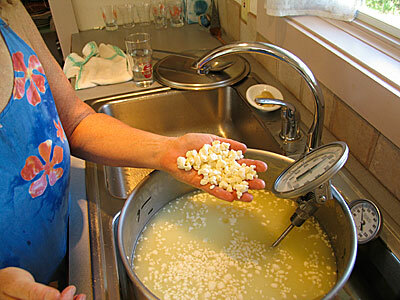 Next a board is placed on your draining surface under the ball of curd. The top is then tied off with string and the extra cloth is carefully spread evenly over the surface. Another board is place on top and a light weight of 4-8 lbs is carefully balanced on top. This will be the weight for about 1hr and then a weight of about 25 lbs will be used for another 4-6 hours. At this point remove all weight and let the cheese rest at ~68-75F overnight. 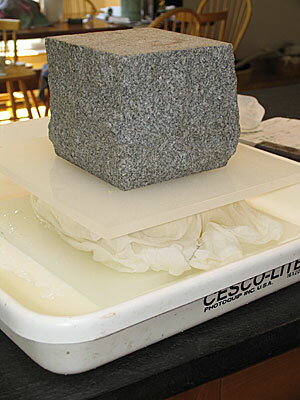 The next day the cheese surface is allowed to dry off for another 1-2 days establishing a firm rind. It then goes to a cooler cave (54¡F) where it continues to dry off more. After about 5-8 days and the rind becomes quite dry, a light coat of olive oil* can be applied and repeated every 3-5 days for about a week. Following this a good brushing every 3-7 days until a firm coat is established and apply a bit more oils as needed. 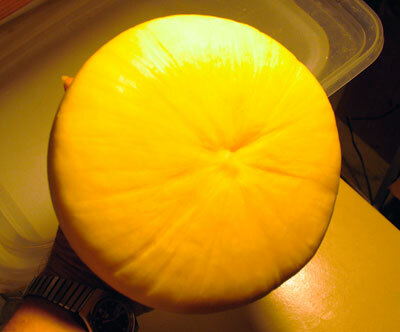 This cheese will be ready in 3-8 months. Made using one gallon of milk and ended up with 1 pound of cheese. I used a cutdown plastic coffee can for the mold, a homemade press and cast iron pots for the weights. 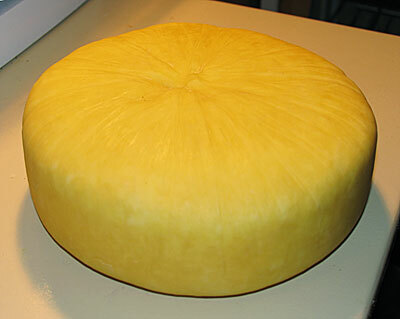 I cut the cheese in half for two 1/2 pound rounds before waxing. Can't wait to taste it. It'll be a long month. This was the best cheese I have made and tasted. Will certainly make it again.